This simple yet large exterior plan is about finding solace in designing with use of stonework, natural lighting and lawns in a perfect modern balance. This exterior idea is mainly for mansions and large open areas where there is a scope for experimenting with the outdoors. 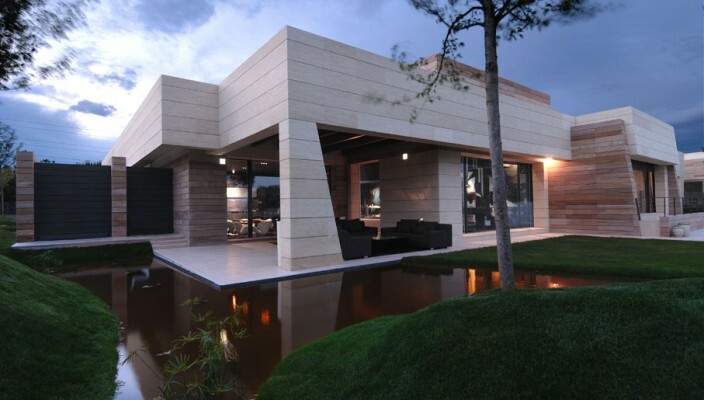 The design features the exteriors in stonework with natural lighting allowed and with use of glass panels. Also, natural sources of water allowed outside with use of green lawns, and this is ideal home that one might think of investing in the long run. Of course, there is space for some gardening, as well.